When I first saw D&D being played by a friend's older brother, it was Advance D&D. I still remember the moment. So, of course, I wanted that game. Looking through a Consumers Distributing catalogue, I saw D&D...but this was in a box. Still it was D&D, must be the same thing. It was the Basic set. But it didn't matter. It still had the funky dice I'd seen the teens rolling. Ah...halcyon days. I started with the Moldvay Basic set. Honestly, for years I don't think my friends and I even acknowledged the difference between editions. We never played with "all" the rules anyway so anything from any book was fair game. One friend had AD&D stuff, his older brother still used OD&D books when he ran, etc. We were too lazy to be rules lawyers too. I think that remembering that magical spirit of wonder and possibility is what has kept me interested in D&D all these years. Later I did come across some Advanced players but they had funny ideas (no longbows for thieves? WTF?). By the time I did get the edition wars I had moved on to RuneQuest so I didn't care. Probably because BASIC was out for so long before EXPERT and sold many more copies in its various editions. I don't know, it seems to me the "Basic" thing is a modern construct. Back then everyone just called them D&D and AD&D. I second that. Basic was Basic. D&D sort of blanketed everything because I don't know of anyone that was all ADVANCED d&d. It was a blurry mix and you were lucky to know anyone who played outside your group back in the 80s. Basic, sort-of. I owned Basic first, but my uncle ran AD&D mixed with Holmes basic and the guys who taught me the game rules mixed in AD&D and house rules with D&D. I was introduced to the game in 79 by a group that used OD&D with a bunch of optional rules from Dragon, the various supplements, and a bit of AD&D. The first edition I owned was B/X. Pretty much the exact same thing for me. Id looked at this otus illustrated bx set but then played the red-elmore box set 83? Had accessories and modules of both sets. Adnd took over a year later and got us into a more sophisticated setting and enjoying character stat/race/class changes and flexibility. I like the skill system in oriental adventures dungeoneers survival guide. Fighting fantasy game books were big too. After second ed we played mostly forms of BRP and tsr marvel for 20 years. I got back into these tropes and early dnd when i got back into DnD a few years back. Played basic once and moved to AD&D. I didntvreally know their was a difference beyond writing style and more monsters, levels,spells and everything. Holmes all the way…I guess it was 79 or so…then we progressed on to AD&D 1e. Bought the 2E books, but by then we used a lot of house-rules with 1E…then Life took over. Played both at home the same time and was too young to notice or care. The benefit of an older brother and his friends having these books and boxes. I bought the very last "basic" set TSR put out in 1994... "The classic Dungeons and Dragons game" from a bookstore in Lake Geneva (not THE store, I want allowed in that den of Satan) I had the second printing box. I'm pretty sure it had plastic 15mm miniatures and a fold-out map. I had to keep the thing hidden so I never got to actually play it for real. This right here was it for me too: TSR 1106, the mid-90s update to the old "1070" black box basic. Sadly, my friends and I moved on from this "Classic D&D" set to AD&D 2nd edition, and that only a few years before 3rd edition came out. To this day, I feel cut to the quick by a sense of missed opportunity, knowing that I had numerous chances to pick up a Rules Cyclopedia instead... and we thought that it was for kids, and that 2nd edition was *way* better and more sophisticated. Ugh. Well, at least we know better now. I started with the 2nd edition AD&D stuff. It wasn't an ideal jump off point lol! My go to D&D game now is ACKS, but I really wish I'd started in the hobby with the superlative Moldvay Basic. I picked up a copy on eBay recently and it's pretty much perfect, my group just prefer ACKS for the classes and tidied up rules. Ahh, I remember those days. There were Edition Wars before there were even Editions. Never bothered me. If you don't like it or you want to look down your nose at it - that's cool. Don't play. The quality of a table top RPG relies far less on the game than on the group playing it, and if one or more of the players is going to dismiss the game then it's not a game they belong in. I started with Holmes Basic circa '78-79. The 1e AD&D books were just in the process of being released. At my FLGS, I think the MM was the first of the hardbacks we got a hold of. It was about a year (I think?) before we had the 3 main books. Started with Basic D&D, one of the box sets that I got for Christmas. That lasted a month until my birthday when I got the AD&D DMG. "Oh. You play D&D? What's your character?" "I am a 2nd level Elf!" "Right. But what class is your character?" "Huh? So, you're second level. And you're an elf. But you're an elf... what?" I started with Molvay Basic as well, bought the 1e AD&D books later and spent many hours reading them, but actually didn't play AD&D until 2nd edition. It was weird back then because while I started with the red box, the stores we shopped in mostly had second hand AD&D books, not the new stuff, so the first AD&D book I saw was the first one printed, the Monster Manual. It confused the heck out of me because it was so much more complicated, and of course that meant *better* to my 12 year old brain. I was an AD&D wannabe and if I had known any AD&D players I would have begged to play. :) But I loved basic, and the fact that it took you up to 36th level and beyond was amazing to me, and I learned to appreciate how much faster it played. The first thing I had was the Holmes Basic set, but what we played at the time was a mix of white box with AD&D stuff added in as the books came out. We dropped D & D for RuneQuest sometime after that. As I recall, we played lots of other games as well: Boot Hill, Top Secret, Gamma World, Champions, Traveller etc etc. Gamma World was the first for me, but I'd owned D&D Basic prior to that. My first game was using Basic but with AD&D character sheets....my sister and her friend wanted to be fighter/MU and thief/MUs respectively because their character sheets allowed it. After that I snagged Expert and used that for a while. I quickly figured out Basic/Expert was a precursor and spent several months in 1981-82 hunting down AD&D at local book shops. After that, I used Basic for mechanical rules when AD&D proved too confusing, which meant pretty much this: I used AD&D for classes, spells, monsters and items, and all the "non rules" components like dungeon design and encounters. I used Basic to resolve initiative and combat, and also leaned on the details in the Expert book because it was so succinct on how to design wilderness encounters. Sometimes I'd just reference B/X because it was quicker and easier to find something in there. I'd probably have stuck with B/X but I hated how it made a race a class, and loved the flexibility (for the time) of how AD&D let you choose a race and a class, as well as multiclassing. Then I found Fantasy Trip, T&T, Runequest and Dragonquest and that sort of blew the whole thing wide open. I started roleplaying in 1981 with the very box you have pictured above, and got the Expert set the next year. I eventually acquired most of the AD&D books, but I never really "switched over". To this day, even when theoretically running "AD&D", I still use the B/X melee round and allow thieves to use any weapon. No one has ever complained about any of this. My initial intro was watching my older cousin playing in his mom's basement, on a ping-pong table, circa 1977. (with all the trimmings: Rush on the turntable, lava lamps, and a "fragrant haze" which made my mom angry - I was 8 at the time.) Those guys were playing out of the OD&D set, with parts of Supps I-III, and a fair amount of Judges' Guild material (it was a CSIO/Wilderlands campaign). Fast forward to middle school, and I noted some guys gaming in the cafeteria, before school, at lunch, and after school. I said to them that it looked like D&D, and soon joined them. It was a mish-mash of AD&D, B/X, and Holmes. For about 6 weeks, I was mooching dice, before my dad came home with the Moldvay set for me, which he'd picked up on his way home from work. I remember being disappointed that B/X didn't have exceptional strength. Eventually, everyone got at least a PHB, the group makeup changed, and we moved on to AD&D. There was some snobbery about AD&D vs. basic, and even then, there was a sense that the Holmes basic was "better" than Moldvay among a few of the guys who started with it. (In a similar manner, I kinda look down on BECM a little, being a "Moldvay Guy"...but that is another debate.) However, none of this ever rose to the point of acrimony, where people refused to play basic, or refused to let people use a Basic PC in an AD&D game, (after it was tweaked upward toward a more AD&D base). It was all just "D&D" to us, even when we introduced some gamma world elements into the mix. I started with the red box, the group I joined had played d&d up to immortals and ad&d but one of the players split and started a new group as dm because he didn't like their playing style, they were all about magic weapons, probably loved 3.5. So I got invited to join to round out numbers, this must have been 85, the Larry Elmore box. We went up to companions I think, then switched to ad&d. That group fell apart and then I joined another in time for 2e but we house ruled a lot and mixed ideas from first and second. My next group was core 2e and when that fell apart about 92, I haven't played until I just joined a 5e game on reddit using hangouts. Which I like, it sort of mixes d&d, ad&d and 2e. 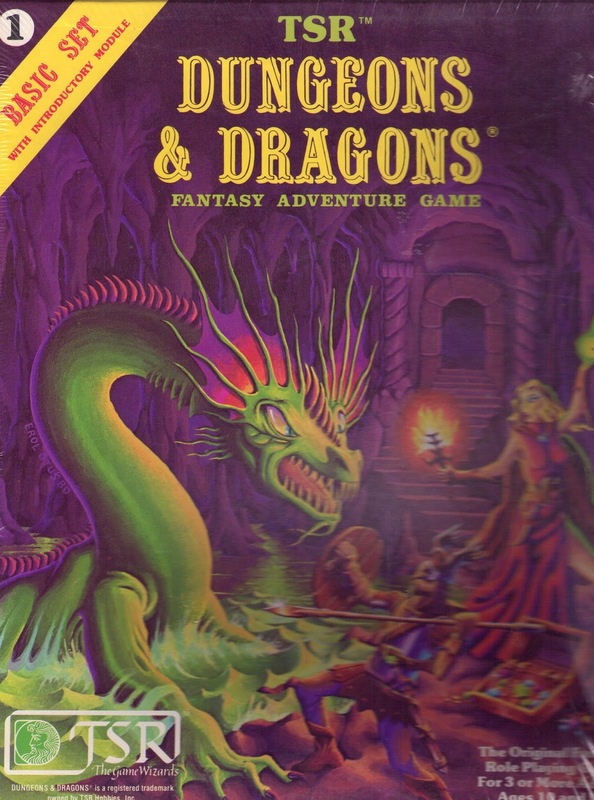 Moldvay Basic was my first game from age 10-13 when me and my friends discovered AD&D 1e. I skipped the 2-4e years and and all the infighting that came with it. I still prefer B/X and hen I talk about it as my preferred game, most of my friends today just shake their head at me and sigh as if to say, "Hokey religions and ancient weapons are no match for a good blaster at your side, kid." - wouldn't have it any other way. B/X which quickly became B/X + AD&D classes, spells, monsters and magic items. I started withthe Holmes basic set. . thought itwas a wargame and picked up a few blister packs of dwarves and goblins. Boywas I surprised when I opened that box and started reading. Holmes Basic. Played through Keep on the Borderlands while I was buying the AD&D books as they were released. Then onward and upward to Advanced! Or so we thought. While I was definitely an advanced snob in my teens, I really appreciate all incarnations of the game now. I started with Moldvay Basic and Marsh/Cook Expert but I and my gaming group freely mixed in elements from OD&D, which was still available at the time, and AD&D. Quite frankly, I didn't really understand the differences so all aspects of D&D were welcome at our game table. It was only with the release of the Companion box set that B/X D&D started to really diverge from AD&D in our minds though we used that box too. No one in my group ever bought the Master box though, by that time we had moved into using the AD&D hardbacks exclusively and I never looked back. Truth be told.... Still am!